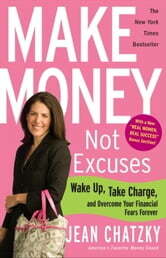 Jean Chatzky has heard all the excuses for why women don’t deal with their finances. She used to make them herself. For the first time, Jean tells you how she made every financial mistake in the book—not paying her bills, going into credit card debt, letting her 401(k) lapse—before finally making the decision to take control of her money and her future. Jean is famous for her ability to explain money and investing. In a clear and accessible way, she breaks down all the scariest parts of dealing with money—from investing in stocks to saving for your retirement—to make them doable, easy, and yes, even enjoyable. She also includes throughout a “Map to a Million,” great tips on easy and quick financial changes you can make immediately . . . that really add up! If you want to get rich, if you want to be wealthier than you are today, you really need to do only four things. That’s right, just four things. Everything else is just window-dressing. The fees—and how to avoid them. The advisors—and how to hire them. The deals. The scams. The ins. The outs. They are all interesting. Some of them are even quite important. But until you have conquered the heart of the matter, they are all minutia.